Being the middle of July, we're getting close to fall, which means we're getting close to Christmas. I posted before about two things I'd like to bring together. People seem to love making gingerbread houses, but they're sometimes a challenge for kids, so I posted on making Christmas cereal treat churches as a silent auction fundraiser. (You can see my attempt below.) 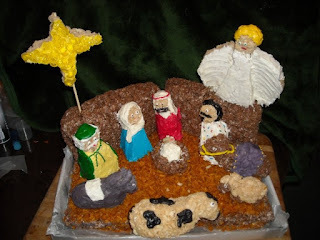 I also posted on having a Nativity on Parade, an idea I love as I love seeing everybody's nativity scenes when I visit them. What a cool Advent evening event that could be! 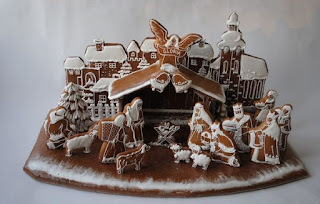 Today I want to bring them together and think it would be a great idea to open up a gingerbread church or nativity contest to the community. 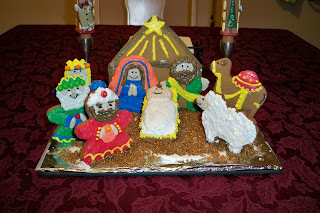 Obviously I'm not going to be winning any Christmas baking contest any time soon, but it was fun! Everything (except the base) must be edible. All structures will be tasted and hopefully eaten with coffee/milk and joy after the competition. Judge entries on overall appearance, originality and creativity, difficulty or complexity, and taste. Who wants a beautiful gingerbread nobody can eat? Have forms so everybody can vote, a specific group that will vote anonymously, or both! Have two categories: gingerbread and/or cereal treats. Have free beverages and other baked goods (maybe for sale - the youth could make some money). Combine it with a homemade ornament sale. Get to know your neighbors!!! Make it fun! Don't make it so serious or formal that people forget to laugh at themselves and each other. Share the joy of the season! Always be sure to invite the community to an event like this and don't forget to have the pastor share the gospel story for why we celebrate the birth that inspired all these lovely edible treats before the winners are announced. After the winners are announced, EAT THEM! Yum! I'm really feeling in the spirit now!